Panoramic prints canvas from your photos and pictures with vibrant colours and high resolution printing. 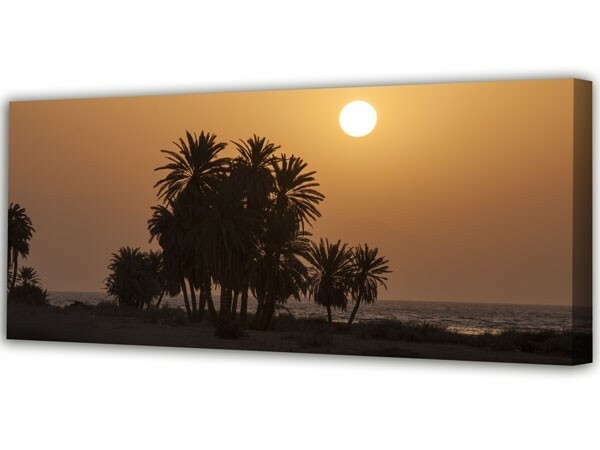 Our high quality panoramic prints canvas are a beautiful way to display your photography. We offer a range of sizes for cameras, iPhones, pads, and phones. Simply upload your photo and select the size range that best suits your image; create your own personal wall art. Our prints are stretched and hand-framed over natural pine bars. Panoramic prints canvas from your photos and pictures with vibrant colours and high resolution printing. 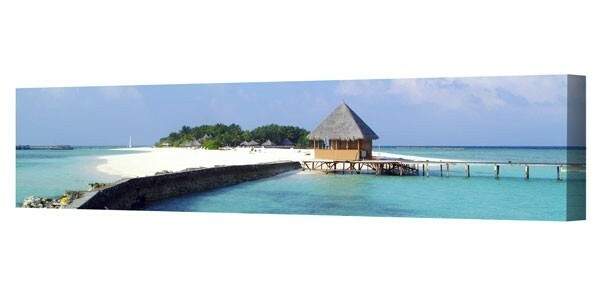 Our high quality panoramic prints canvas are a beautiful way to display your personal pictures & landscape photography. We offer a range of sizes that match many different cameras, iPhones, pads, android phones or other digital devices. Hand framed over knot free pinewood bars. 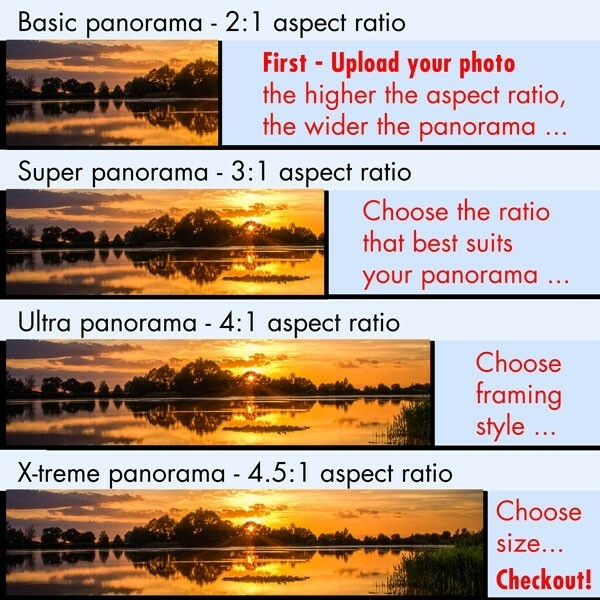 Simply upload your panoramic photos and select through the different aspect ratios until you find a size range that suits your photography. Create your own personal canvas print wall art. We offer a personal service and will adjust your picture to ensure that it prints to canvas as beautifully as possible. After printing, our canvas prints are left to dry for 24 hours in order to ensure that the ink is fully dry before framing. We then hand stretch and frame your print using ethically produced, knot free redwood pine bars (38mm deep), ensuring that your wall art is perfect for display in your home or office. Your canvas print will be despatched 2-3 days after ordering, complete with a wall hanging attachment on the back of the frame. Mirror picture over frame sides. By default this is normally best for landscape or panoramic photography. Panoramic images normally have a substantial width and not much height. In order to retain all of the photo on the front of the frame, we reflect the image and wrap the mirrored reflection of the frame sides. This allows the photo to be continued over the sides of the frame without losing any of the composition. Wrap picture over frame sides. We use some of the photo to cover the sides of the frame. Choose this option if you have spare area around the outside of your photo. This is normally suitable for images with large amounts of sky or foreground. Plain canvas on frame sides. For the purist simplicity, this option allows the complete photo to be printed on the front of the frame whilst the canvas on the sides of the frame is left unprinted. For detailed information on our framing styles please see our webpage on canvas framing. Our website will display a preview of the options about as you select each one, helping you to choose which best suits your particular style of photography. Should you need any assistance with your order or have any questions prior to ordering your print, please contact us. High resolution canvas printing on softly textured canvas. We stretch & hand frame our canvas over knot-free redwood pine bars. Our prints are shipped ready to hang, complete with wall hanger on the back of the frame. FAST SERVICE - DESPATCH IN TWO TO THREE DAYS. Please note: Depending on size and delivery location, prints may be sent with Fedex, Royal Mail or Parcelforce. Panoramic prints canvas. Very prompt return of an exceptionally well prepared and presented picture. Delighted. Immediately ordered more. Ordered and delivered in days!